Side entrance. 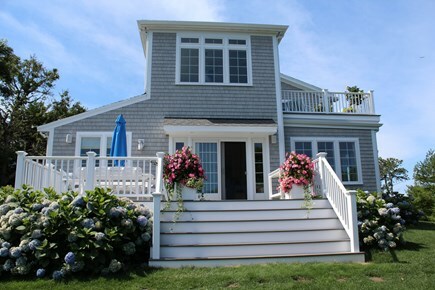 Multiple decks with water views and flowers. Aerial photo of our location. We are steps to private beach. 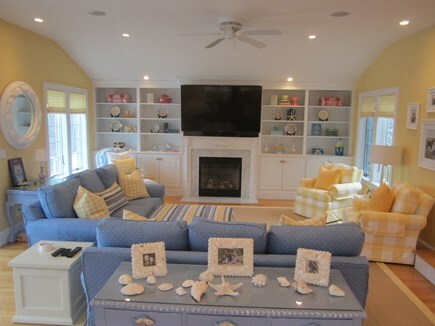 Family room- stunning decorating throughout. 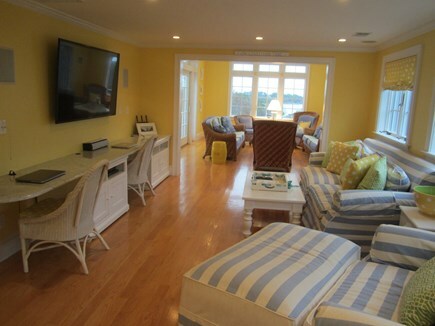 2nd story sun room with frig/water views and bird's eye sunsets. 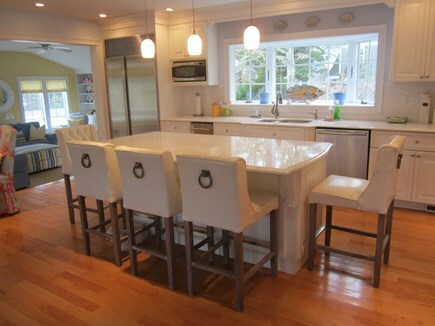 Large, newly renovated kitchen w/high end appliances, gas stove. 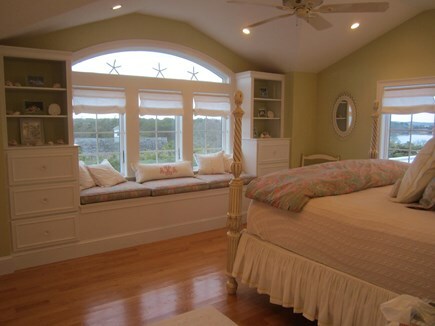 King master bedroom with water views and breathtaking sunsets! 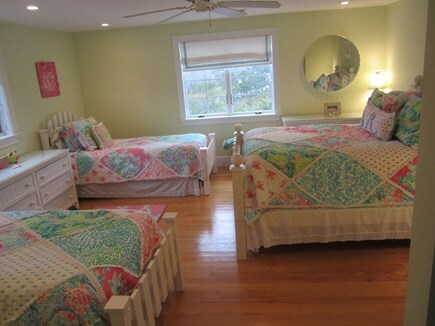 Queen bedroom on 1st floor. 2nd floor bedroom. Queen with 2 twins. Wonderful for children! Bunk bedroom on 1st floor- kids love it! 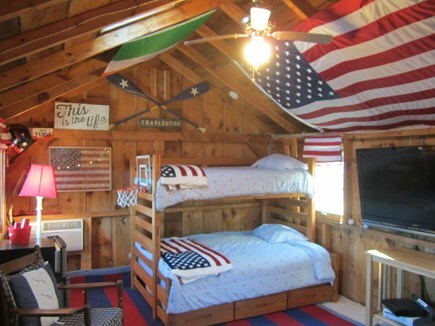 Bunk house w/ games, AC, TV, so cool for the kids! Living room open floor plan throughout. 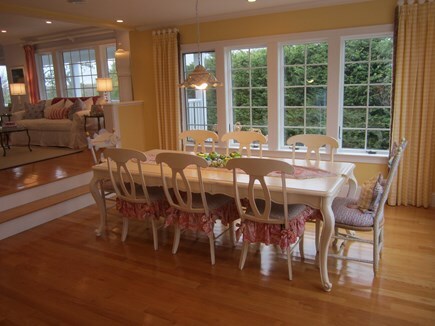 Dining room with seating for 8+ and McKenzie Childs fish chairs. 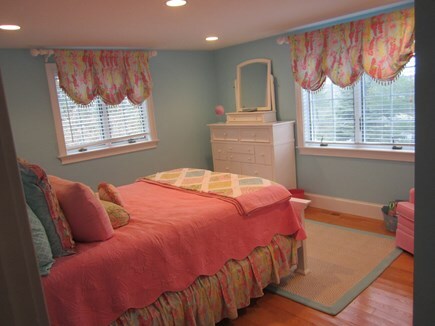 King bedroom in basement with full bath. Deck and bunk house with bunk beds, large screen TV and games. Private beach on Crow's Pond just steps away. 2nd floor full bath with double sinks and walk in shower. 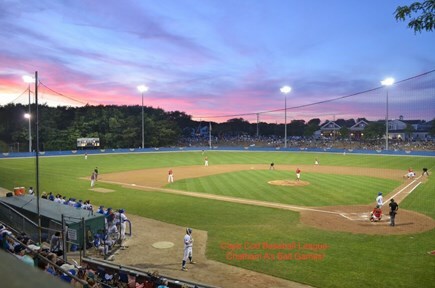 Chatham A's- part of the Cape Cod baseball league. Large, newly renovated home on a large private lot in a family friendly neighborhood. 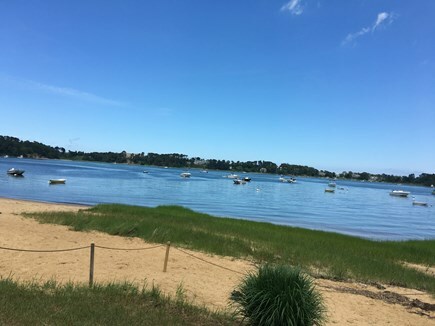 The home sits atop the highest point in North Chatham with views of Crows Pond (salt water inlet), Pleasant Bay, North Beach and the Atlantic. The Eastward Ho gold course and club house are visible from the decks. Watch the amazing sunsets from above the tree line on the second story deck with lots of seating. Dine outside on lower deck with seating for 8+. 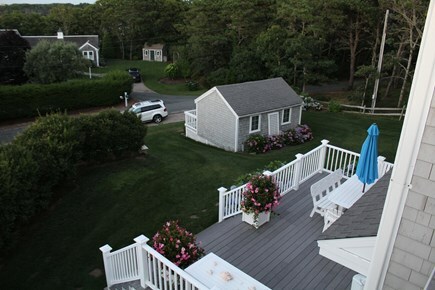 Steps from the home is a private beach on Crow's Pond which opens to Pleasant Bay and the Atlantic. The beach is family friendly and ideal for small children. New washer/dryer and high end appliances. 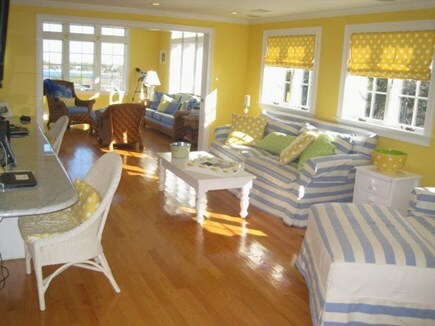 We supply linens, towels, beach towels, beach chairs/ toys, gas grill, bikes (4) and many family games. Enjoy the central A/C, large screen TVs and multiple decks with 14 sets of speakers inside and outside for the music lovers. 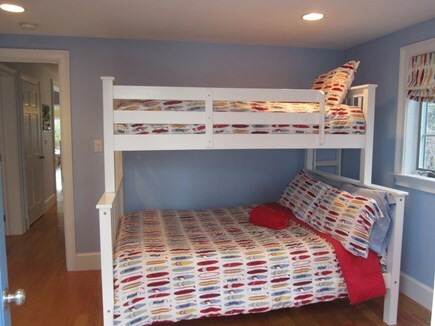 There is a bunkhouse which the children will love with large screen TV, A/C, bunk beds, and games. 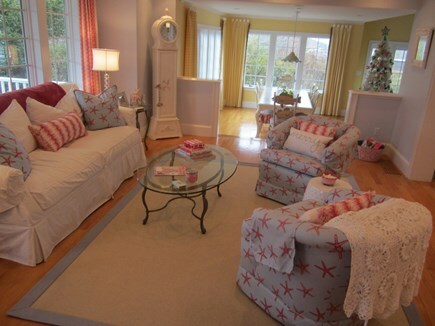 This is the first season we are renting this pristine, impeccably decorated home. Additional photos available upon request. 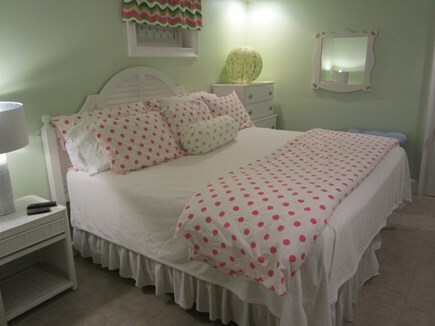 Additional pricing info: $300 per week cleaning fee. State and local taxes of 12.45% will apply. 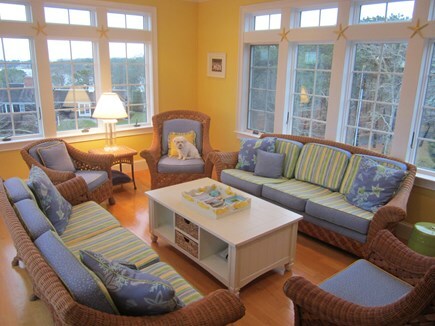 We are a Boston area family and vacationed in Chatham for many years before investing in this property. 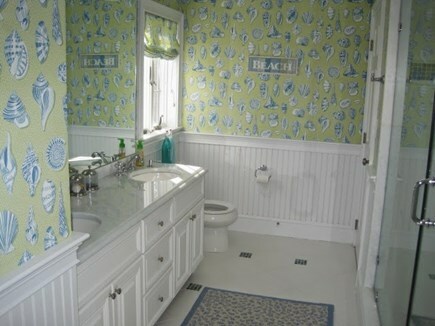 The home is newly renovated and in pristine condition. The 2019 season will be the first time we have offered the home for rental. 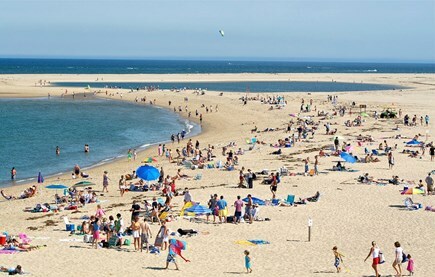 Chatham is a destination for vacationers from all over the world with its beautiful beaches and downtown area with fine shops and restaurants. 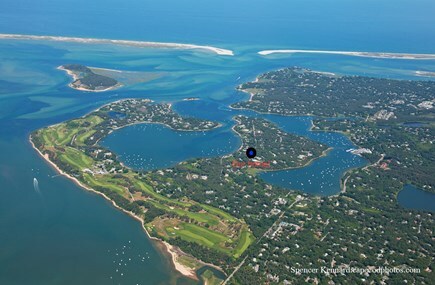 There are two high end resorts nearby including Chatham Bars Inn and the Wequasset Inn (minutes from our home). Check out activities at the these resorts including the Wequasset Jazz Festival.